Data governance should empower your business―not slow it down. That’s why it’s important for data governance to be both agile and scalable. 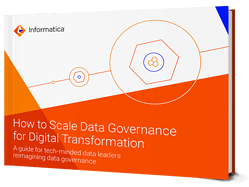 Download “How to Scale Data Governance for Digital Transformation” for no-nonsense advice on extending data governance across the enterprise. Data governance can support everyone in your business. Download the eBook “How to Scale Data Governance for Digital Transformation” to learn more.